George Washington (February 22, 1732 – December 14, 1799) was the first President of the United States (1789–1797), the commander in chief of the Continental Army during the American Revolutionary War, and one of the Founding Fathers of the United States. Washington's mother was Mary Ball and his father was Augustine Washington. They owned a plantation with slaves in Virginia. George studied at local schools in Fredericksburg, and was also homeschooled for part of his life. George's mother was unfit to care for him and his father died when he was 11 years old.
. He failed and many of his men were killed. The fight opened the French and Indian War, bringing Britain into the Seven Years War. In 1759, Washington married a widow named Martha Custis. The marriage produced no children. Washington was a delegate to the First Continental Congress, which was created by the Thirteen Colonies to respond to various laws passed by the British government. The Second Continental Congress chose him to be the commanding general of the Continental Army. Washington led the army from 1775 until the end of the war in 1783. After losing the big Battle of Long Island, and being chased across New Jersey Washington led his troops back across the Delaware River on Christmas Day, 1776, in a surprise attack on Hessian mercenaries at the small Battle of Princeton and Trenton, New Jersey. The British had more troops and more supplies than Washington, however, Washington kept his troops together and won these small battles. Overall, Washington did not win many battles, but he never let the British destroy his army. With the help of the French army and navy, Washington made a British army surrender at Yorktown, Virginia, in 1781, as the final major battle of the Revolutionary War. The war officially ended with the Treaty of Paris in 1783. When the Revolutionary War ended, Washington was considered a national hero. He was offered a government position that would have been considered a dictatorship over the colonies, but in a surprising move, Washington refused, left the army, and returned to Mount Vernon. He wanted the colonies to have a strong government but did not wish to head that government, nor did he want the colonies to be run by a tyrant. A few years later, Washington was called upon to host the discussions for the new government. He was voted president of the Constitutional Convention in 1785. Washington wanted the states to ratify the Constitution of the United States, and they did, largely thanks to the Federalist Papers, which were written by Alexander Hamilton, John Jay, and James Madison. 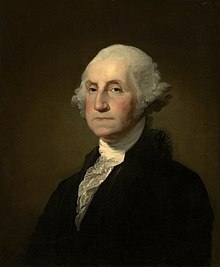 In 1789, Washington was elected president without any competition, making him the first President of the United States. While Washington did not belong to any political party, he agreed with certain Federalist policies, such as the country should have a standing army and a national bank. He was re-elected to a second term. After his second term, Washington decided not to run for reelection, despite his popularity remaining high. His decision, to stop at 2 terms, set a precedent that every president followed until Franklin D. Roosevelt in 1940. In Washington's farewell address, he warned the country not to divide into political parties and to not get involved in wars outside of the United States. Washington's non-intervention foreign policy was supported by most Americans for over one hundred years. His advice to avoid political parties was completely ignored, as parties were already forming at the time of his speech. Washington went back home to Mount Vernon (Virginia) after his second term ended in 1797. He died 2 years later, on December 14, 1799, in Mount Vernon, at the age of 67, from pneumonia. From his marriage, George Washington owned a substantial amount of farm land, where he grew tobacco, wheat, and vegetables. Washington also owned more than 100 slaves, who were freed upon his death. He did not have much money in cash and had to borrow money while he was president. At his death, Washington's estate was worth over $500,000. It is a common misconception that George Washington had wooden teeth, as false teeth made from wood. He did, however, try many different ways to replace his teeth, including having teeth carved from elk's teeth or ivory. Ivory and bone both have hairline fractures in them, which normally cannot be seen, but started to darken due to Washington's use of wine. The darkened, thin fractures in the bone made the lines look like the grain in a piece of wood. George Washington's teeth started falling out when he was about 22 years old, and he had only one tooth left by the time he became president. It was difficult for him to talk or to eat. At one time, he had false teeth with a special hole so the one tooth he still had could poke through. He tried to keep them smelling clean by soaking them in wine, but instead they became mushy and black. In 1796, a dentist had to pull out George Washington's last tooth, and he kept his tooth in a gold locket attached to his watch chain. When the time came for the president to have his portrait painted, cotton was pushed under his lips to make him look as if he had teeth. The cotton made his mouth puff out, as is seen on the picture on the US$1 dollar bill. ↑ Ferling 2009, p. 274; Taylor 2016, pp. 395, 494. ↑ Randall 1997, p. 303. ↑ Engber, Daniel (2006).What's Benjamin Franklin's Birthday?. (Both Franklin's and Washington's confusing birth dates are clearly explained.) Retrieved on June 17, 2009. ↑ The birth and death of George Washington are given using the Gregorian calendar. However, he was born when Britain and her colonies still used the Julian calendar, so contemporary records record his birth as February 11, 1731. The provisions of the Calendar (New Style) Act 1750, implemented in 1752, altered the official British dating method to the Gregorian calendar with the start of the year on January 1. ↑ "Image of page from family Bible". Papers of George Washington. Retrieved 2008-01-26. ↑ Richard Shenkman; Kurt Reiger (1980). One Night Stands with American History. New York: Morrow. p. 39. ISBN 978-0-688-03573-0. ↑ "Drilling Holes in George Washington's Wooden Teeth Myth". Retrieved 2015-03-09. Wikimedia Commons has media related to George Washington. Polack, Peter (2018). Guerrilla Warfare: Kings of Revolution. Casemate Short History. ISBN 978-1-61200-675-8.